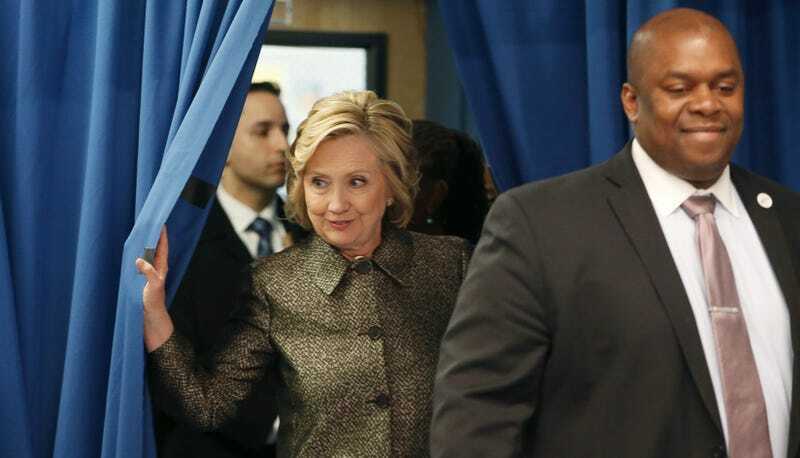 Multiple outlets are reporting that Hillary Clinton, long and wearily rumored to be running for president, will finally officially announce said campaign this weekend. Last week, reports surfaced that Clinton had rented campaign space in Brooklyn, of all places. As Politico noted, “Federal Election Commission rules state that a candidate has only 15 days between conducting campaign activities and filing the official 2016 paperwork, and the lease signing could start the clock on an official launch.” The increased speculation began. On Thursday evening, Business Insider reported that a source had told them that Clinton would be announcing this weekend. A few hour later, Reuters reported the same, citing multiple sources. The Guardian reported that the announcement would be made “on Twitter at noon eastern time on Sunday, the source told the Guardian, followed by a video and email announcement,” and it seems to be expected that no matter when or where it is made, she’ll quickly travel to Iowa to begin campaigning. A Quinnipac poll released this week found that Clinton’s no longer ahead of recently announced her Republican challengers in either Iowa or Colorado. The press has been quick to point out how much Hillary’s announcement will outshine Marco Rubio’s; he’s expected to announce his bid for the presidency on Monday. But we’ve got a long campaign ahead of us, as no other Democratic nominees have thrown their hat in the ring yet. Make sure to take small portions of your campaign news and chew slowly, otherwise you’ll get full like, tomorrow.